PJ Solomon investment banker Mark Boidman gave a fast-paced talk on the strengths and risks of out of home at the May 7-9 GO2018 conference. Here’s a summary. The big audience. Out of home is the only form of media which can deliver an unsplintered audience. TV in particular has fragmented. A prime time show or TV event does not deliver the viewership it used to due to the proliferation of TV channels and cord cutting. Projected growth. 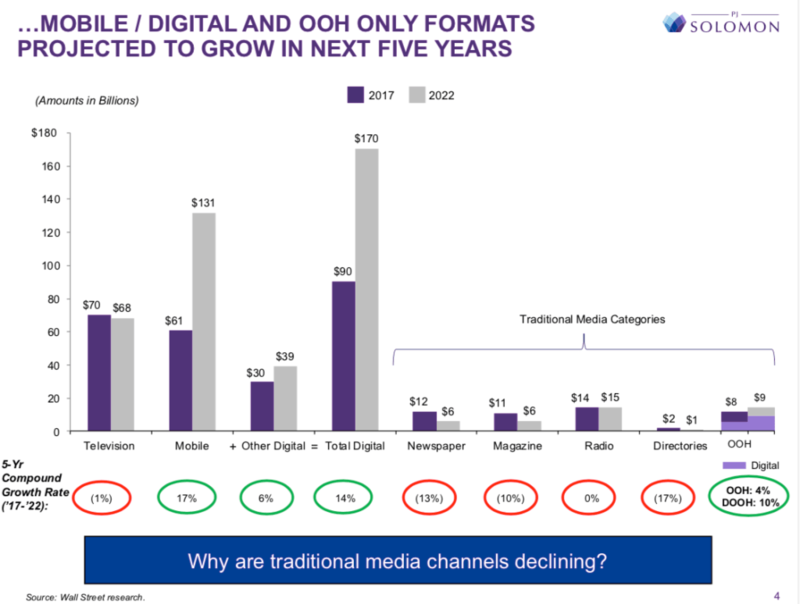 Out of Home is the only form of media which is expected to grow in the next four years because technology is a friend to out of home and an enemy to most other media. Digital billboards and smartscreens will drive revenue. Look at this slide. Out of home is projected to grow 4%/year over the next five years. Newspapers, TV, radio, magazines and directories are projected to decline. Out of home overindexes with top brands. Google and Apple are spending 9% of their advertising budget on out of home while the average for all US companies closer to 3% on OOH.